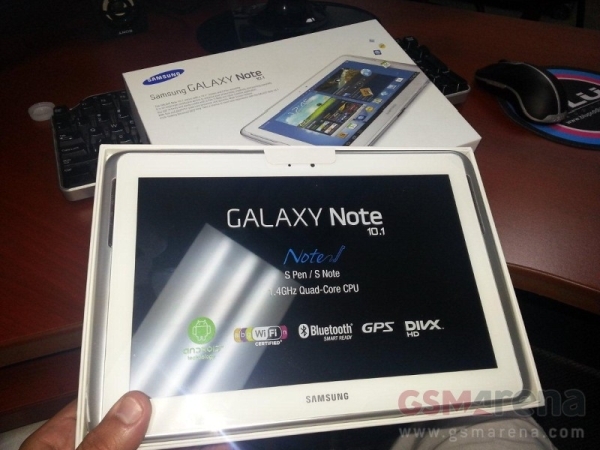 US Galaxy Note 10.1 shipping to retailers ahead of announcement? The US Samsung Galaxy Note 10.1 is expected to be announced at the Samsung US event on August 15 but US retailers are already receiving units. The model number of the recent stock is the same as the European variety so perhaps what we're witnessing is the first wave of availability of the international Galaxy Note 10.1, and not the US spec device. US retailer CT-Miami sent us some unboxing pictures of the Note 10.1 they have. The specs include a 10.1-inch, 1280 x 800 resolution display, 6.5mm S Pen stylus, quad-core 1.4GHz processor, 2GB RAM, 16GB built-in memory, 5 megapixel camera with 1080p video recording, 3G+GPS, a 7000mAh battery and an IR LED to use the tablet as a remote control. What's more interesting is that these specs and the model number printed on the box indicate that this is the European model, which makes us curious as to why the American retailers are getting it. There is no LTE support and the HSPA bands will only work with AT&T's HSPA network. Meanwhile, another US retailer - Negri Electronics - tweeted earlier today a similary photo of an unboxed picture of the Galaxy Note 10.1 and mentioned that it “ships 8/3”, although it's not clear to whom the device is shipping on that day. It's either that the retailers are getting their stock before the alleged launch event on August 15 or as we already said, those are the first available international Galaxy Note 10.1 units (officially, it's still has a Coming Soon status). So far however, we haven't found retailers on our side of the ocean that have the tablet. Samsung never confirmed that their August event in the US is dedicated on the Galaxy Note 10.1, but if it is, we guess they will show a proper US spec model that even has LTE support. I think any 10 inch tablet that has no Full HD (1080p) display is outdated....... The Samsung Galaxy note (5.3 inch) has the same amount of pixels as the tablet (10 inch). It does not work for me sorry guys.